From the worker’s point of view, a job is a service for earning a living. Every worker wants a good service, but it is difficult to find. People will bribe and pull strings to get a job that is not great, because there is a shortage of them. Not much different from buying an automobile in the Soviet Union. Nowadays, Russians can buy any car they want, provided they earn enough to buy one. People need to earn in order to spend, that’s the problem. If we thing about a job as a service, then the earner/worker is the customer and the employer is the service provider. A good provider offers earners better work than they can arrange themselves: better income, benefits, stability, interesting things to do with good people, whereof some will become good friends. 5B people are of working age. 3B are working. Most of them want a job that earns them a living. 1.3B have one. Only 13% are engaged. Almost nobody has a job that fits them. Humanity creates a $100T world economy, running at a fraction of its capacity. If everybody had a job that fitted them, everyone would be much happier and humanity would be creating many times more value than today. Increasing smartphone penetration and new infrastructures like cloud computing and big data analytics can make tailored jobs for every person on earth a reality. We are at the beginning of a revolution in strengths finding, education, matchmaking, HR and the creation of opportunities in a long-tail labor market. Imagine the 3B working people getting jobs they love, capitalizing on their unique skills, talents and passions, being matched in teams with people they enjoy working with, doing meaningful work. How much more value would they create than the unhappy mismatched workforce we have today? A doubling of value creation is for sure far below the real number, but already that adds $100T value to the world. If the job providers would charge 20% commission on the incomes people earned through their services, this would be $40T in revenues. 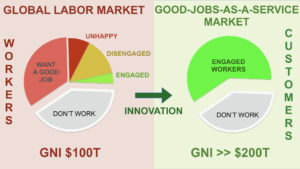 Innovation for good jobs as a service is a narrative that opens the door to truly mind-boggling growth markets, where companies will compete to leverage the value of people. The low-hanging fruit: the most undervalued people. At the i4j Summit, entrepreneurs, funders, educators, policymakers and other leaders from the innovation-for-jobs ecosystem will be talking shop around the business of disrupting unemployment.